Merchants Millpond - Take a Hike! Merchants Millpond is a 3400-acre state park in Gates County in northeastern NC. The closest town is Gatesville and the closest significant city is Elizabeth City, 25 miles to the east. 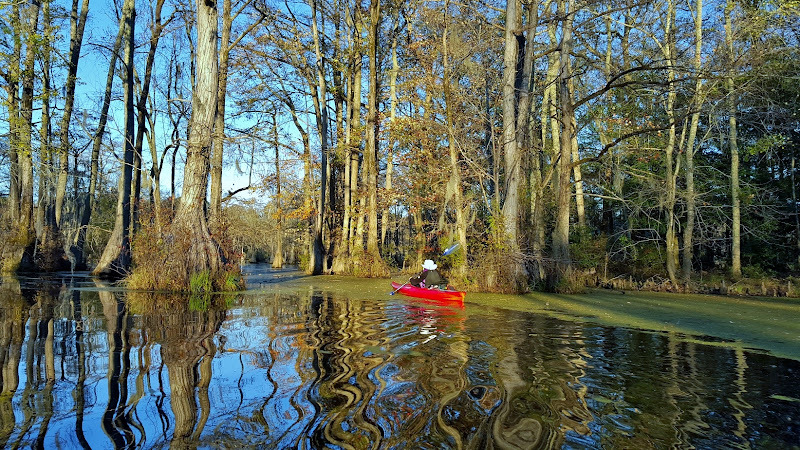 The highlight of the park is the 760-acre millpond with opportunities for paddling. 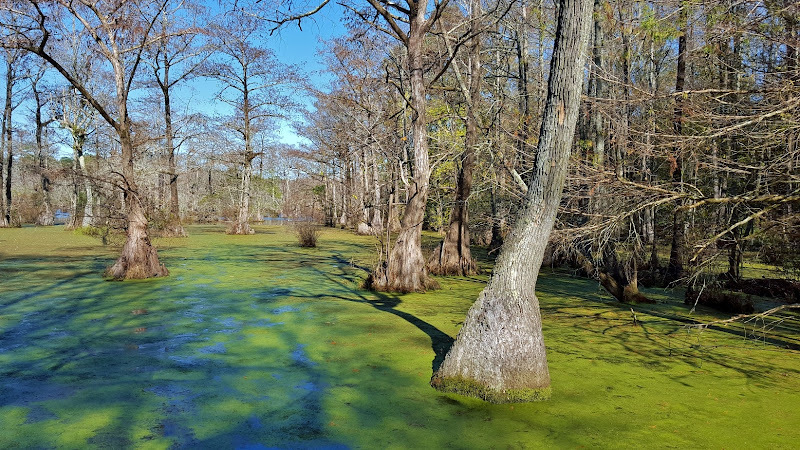 The millpond is almost 200 years old and has developed into its own swampy ecosystem. The park was established in 1973 and the Nature Conservancy has donated additional land to the park. Merchants Millpond is located in the northeastern corner of North Carolina. From I-95, take exit 173 to get on US-158 east. Go about 45 miles and get on US-13 north. In about 6.5 miles, bear right to stay on US-158 east and go about 10 miles. Turn right on Mill Pond Road and the park entrance will be on the left on in less than a mile. There are about 11 miles of hiking trails in the park to explore by foot. The topography is very flat so all the trails are pretty easy. Bennetts Creek Trail is a 2-mile partial loop that leads to its namesake downstream of the millpond. The trail starts at the boat dock behind the visitor center and leads south to a crossing of Millpond Road. Across the road, the trail makes a loop through a swampy area along a tributary of Bennetts Creek before reaching its namesake. There is a wooden overlook that provides views of Bennetts Creek. The trail then departs from the creek and ends back at Millpond Road near the dam. Coleman Trail is the park's Track Trail. Starting from the boat ramp parking area, the trail makes an easy 2-mile loop through the woods along the southern shore of the millpond. About half-way through, the trail passes close by the millpond. Cypress Point Trail is a short interpretive trail that is handicapped-accessible. The trailhead is at the boat ramp on Mill Pond Road. The trail makes a short loop around a small peninsula with nice views of the millpond. Lassiter Trail is the longest trail in the park. You can start at the visitor center or the picnic area. There is also a spur trail leading from the family campground. The trail starts off crossing a creek on a boardwalk and soon splits. Going right to hike in the counterclockwise direction, the trail passes by the individual and group canoe-in campsites and then runs along the edge of Lassiter Swamp. After passing the swamp, the trail loops back around, passing close to an area of private property where hunting is allowed. Boating on the millpond is a great way to see the swamp and "enchanted forest". Canoes and kayaks can be rented from the park office or bring your own and put in at the boat ramp. The Orange Trail leads three-quarters of a mile from the boat ramp on Millpond Road to the Family Canoe-In Campground. The paddle trail is marked by orange buoys. The Yellow Trail is a paddle trail that leads from the boat ramp to the Group Canoe-In Campground. The trail starts following the Orange Trail then splits off, continuing through the millpond to the further campground. Merchants Millpond has several opportunities for camping - regular car camping, group camping, backpack camping and canoe-in camping. See the park's website for information and reservations. The 200-year-old millpond has developed into its own unique ecosystem. Hiking and paddling throughout the park is a great way to see the wildlife. 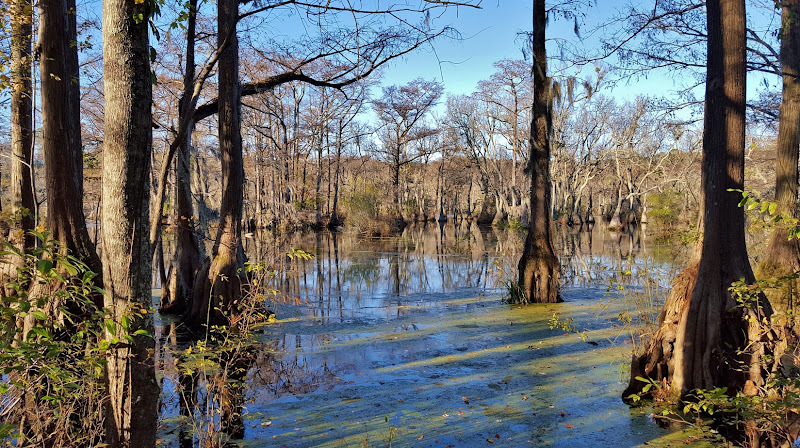 Bald cypress (Taxodium distichum) are common in the swampy millpond, with the trunk of trees often surrounded by knees. American beautyberry (Callicarpa americana) produces bright purple berries in the fall that are an important food source for birds. Lots of fungi grow throughout the swamp. I'm not sure what this is, but it was growing on a dead pine tree. Marbled orb weavers (Araneus marmoreus) are an attractive species of spider that can be found in the park.